The summer monsoon rains end in September here in Tucson as the weather patterns shift. The streams and washes are now mostly dry, and a white crust of salt and minerals can be seen in the sand along the trickles what water remains. 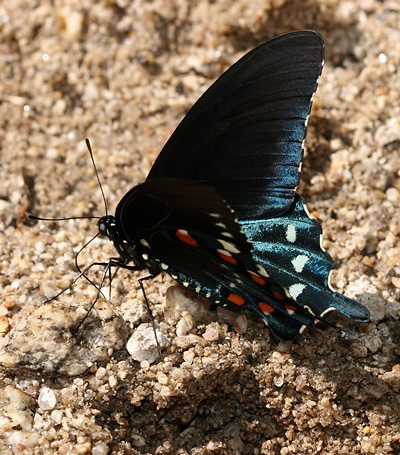 The numerous late summer butterflies enjoy sipping this mineral-rich moisture, and areas of wet sand or mud quickly become popular butterfly watering holes. 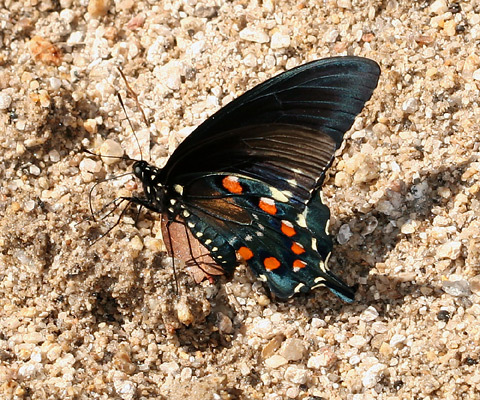 I observed several Pipevine Swallowtails (Battus philenor) perched on the wet sand along the stream at Molino Canyon Vista Overlook near Tucson. 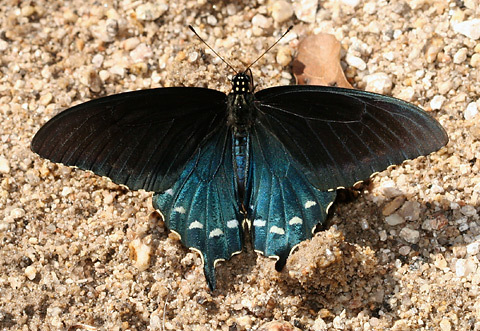 When seen from the proper angle, these large, black butterflies are washed with beautiful aqua iridescence. 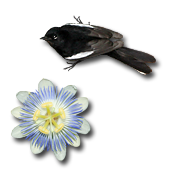 They have white spots on their dorsal hindwings and corresponding orange spots on their ventral hindwings. I would wait with camera ready as a Pipevine Swallowtail would fly to a patch of wet sand and then gently probe for moisture with its proboscis. When the Pipevine Swallowtail found what it was looking for, it would relax, almost with a sigh, and open its wings as it contentedly drank, finally allowing me to get a close-up photo of one of these butterflies with its wings open. Pipevine Swallowtails are common here in Tucson, but they are very active and can be quite challenging to photograph. Photographing them drinking or "mud puddling" is definitely one of the easier methods since it is the only time I ever see them stay in one place for longer than a second.